Check out the hot color trends for 2009. Find tips for saving money and energy with a few simple decorating updates. All in this issue of BRIGHT IDEAS. When time or money is an issue, concentrate your decorating efforts on the most visible areas of your home. In many homes, the kitchen and dining areas see the most activity. Perhaps the dining chairs are a little worn, the colors are drab, or the room just needs some new life. A minor change like new chair seat covers can really help the visual perception and physical experience of those rooms. Add little splashes of color with a flower arrangement and bright dishes. A small spark of color can make a dramatic change. For an even bigger impact, change out an ordinary kitchen light fixture with a chandelier. The economy may be in the doldrums, but that doesn’t mean your decor has to be there too. 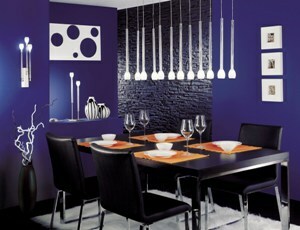 It’s possible to turn dark, dreary and dated decor into light, lively and “now” on just a shoestring budget. What’s the secret to sprucing up on a shoestring? Lighten up – literally. Upgrading your home’s lighting can impart a whole new atmosphere, and you don’t need to spend big bucks on pricey new fixtures to do it. Simple, budget-friendly changes can make a big difference in how your home looks and feels, and how much you enjoy living there. Consider the first impression guests (or potential buyers) have of your home. Upgrading exterior or entryway lighting can improve the curb appeal and first impression of your home. Once you’ve upgraded the outside, take a look at the first parts of the house guests see – often the entryway or dining room on modern floor plans. In other rooms, take a look at your table lamps. One way to make an impact on a small budget is by changing outdated lampshades with newer trend-forward versions that incorporate fashion-friendly colors, fabrics or patterns. Simple upgrades in kitchens and baths can also deliver big impact and enhance your home’s value on a shoestring budget. Adding fixtures such as mini pendants that can be shown off and enjoyed can make a big impact. It doesn’t matter if you live in a home with a modern kitchen that has all the fancy upgrades, or one that just has a single overhead light in the center of the room. If you’re not using the latest generation of energy-efficiency bulbs, it’s time for a lighting upgrade. In today’s market place, decorative energy-efficient fixtures are available in every product category, whether you’re looking for something traditional, modern or artsy. When shopping for energy-efficient fixtures, it’s important to look for the Energy Star label. In order to qualify for the Energy Star designation, the product must meet specific performance criteria for energy-efficient performance set by the U.S. Department of Energy. Purple: The news, the weather, the economy may have people in a rut, but colors are definitely on the festive side for spring, with purple the hottest color of the moment. Brights: A few key colors promise a bright, happy splash for 2009: fuchsia, orange, watermelon, blue iris, lavender, celery green, turquoise, mimosa yellow. Accents: The thought of a purple room may be overwhelming – but the new brights aren’t intended as a primary color but as an accent. It’s all about color combining. You take a color like mauve, pop it with fuchsia, and calm it with taupes. Vintage: Trends move in 20- to 30-year cycles, and the ’80s are the current retro-cool. The shades, tones and usages differ, but the colors are definitely inspired by that era. The new neutrals: Once gray was considered a safe, boring choice. But contemporary neutrals – including gray and taupe – provide an interesting, varied palette, especially combined with brights, such as lime green or bright fuchsia. Geometry: Patterns – in pillows, fabrics and accessories – have taken on a geometric look, with just a tinge of influence from Morocco. Color combination: Today’s homeowners have made decorating – including color – all about personal style. People want to have choices, and the industry is giving them a palette that’s different and interesting.